« What does real horsemanship look like? Top photos are before and after. 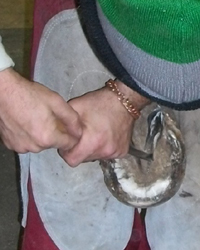 The following photos show and explain the process of shoeing this horse. Shod before by another farrier on the left. After we shod the horse on the right. On the left picture there is a severe twist and deviation on the left front leg as well as a slight devation on the right front leg. After we shod the horse, both legs are in better balance. 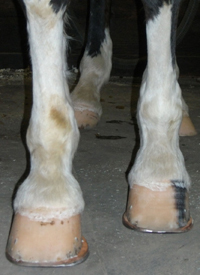 There is still more improvement to be made but changing things too quickly can result in severe lameness and injury. 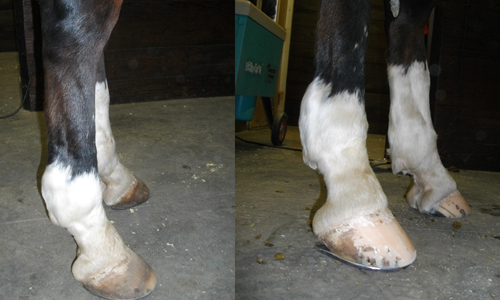 Side view of the fronts before, shod by another farrier, and after, shod by us. Ideally the angle of the heel will match the angle of the toe but due to the severity of the angle disparity, this was the best compromise that could be made. After the next shoeing the angles will most likely match. The hind feet before, shod by another farrier. The right hind foot is after, shod by us. 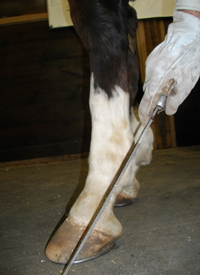 ***The following sequence of photos depicts correct shoeing on a show horse for soundness and extreme performance. 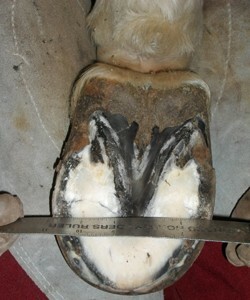 The horse was previously shod with plates by another farrier during its off season. This is a view of the horse as it was shod before we started work to remove the plates and set the horse up with toe weights. 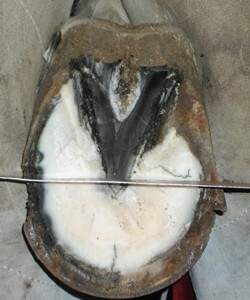 The horse had been on vacation for several months and was being shod by another farrier during its rest period. Note here the extremely low angle at which the horse was shod and the discrepancy between the angle of the pastern and the angle of the hoof wall. 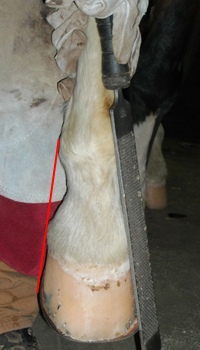 Also notice the stress rings around the top of the hoof. 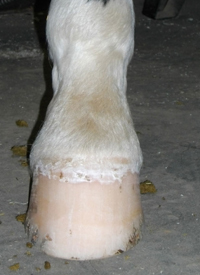 This low of an angle, in conjunction with the long toe, can place severe stress on the deep flexor tendon and can eventually result in mechanical founder – the rotation of the distal aspects of the coffin bone, deviating away from the hoof wall due to pressure and torque during the break roll-over phase. Notice here how the angle of the hoof wall at the toe and at the heel are not in alignment either with eachother or with the pastern. After the foot was trimmed Mark placed last year’s toe weights on the foot to see what changes needed to be done to the shoe in order to fit the horse correctly. 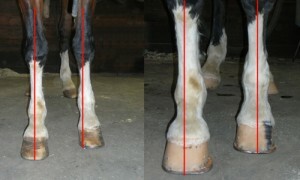 Notice the contraction of the heels shown in this picture – another effect of the long toe and low heel previously evidenced. Notice how the shoe no longer supports the hoof wall correctly in the heel. The heels have contracted at least a 5/8’s of an inch within a three month time span (two shoeings.) Large changes can quickly occur within the horse’s hoof in an extremely short period of time. 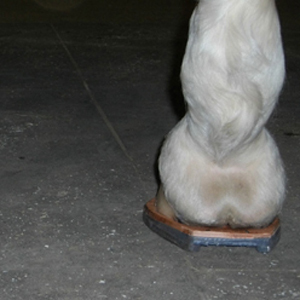 Depending upon the change, returning the hoof to its correct balance may take much longer. Here the shoes have been two-nailed to the hoof. Notice on the flair on the toe. 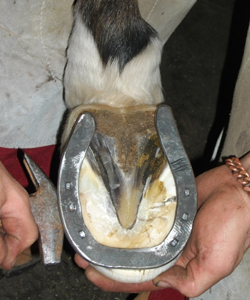 The shoes are set back under the toe in order to achieve the correct breakover point in line with the angle of the pastern. 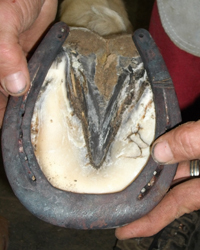 Due to the changes in the hoof wall created by the long toe and low heel, the shoe must be set back to allow a faster breakover. Much, but not all, of the flair of the toe can be removed by rasping. 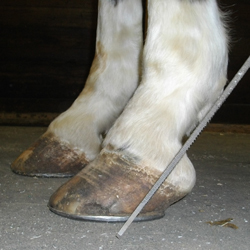 As the hoof grows, it will change its angle and begin to grow more correctly in line with the pastern. This is an example of how changes can happen almost overnight that will take months to improve. Proper suport of the bone structure of the leg is influnced by the surface area and shape of the hoof at the ground surface. 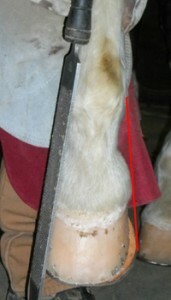 When sighting the foot down, the level coronary band should be seen as the upper part of a cone, with the hoof wall following to the ground surface in a smooth fashion. To create balance, we needed to fit the shoe full to the inside in order to encourage the hoof wall to expand and support the horse as well as provide the necessary surface area to support the horse’s bone structure now. Here is the same foot as pictured above. Notice how the shoe did not need to be fit as full on the outside as the inside and how the angle on the rasp indicates the correct support for the medial portion of the foot. Here you can see that the horse needed a wedge on the heel of the right front. Also notice the extended heel support and the room for expansion of the heels The heelswill expand again in time to their proper size to support the horse. This is a photo of the finished front shoes, before all of the nails had been driven, clinched, and finished. Notice the level, relazed coronary bands and the fullness of the shoes outside the hoof wall, most noticed on the right front. Also notice the pasterns are much more smooth than in the original photo of the horse from the front. Here is a photo of the finished fronts. The shoes extend back as far as the bulb of the heel in order to properly support this horse’s extreme motion. The flair on the toe has been mostly taken off, but will take another shoeing to be completely correct. Here you can see that the angle of the pastern lines up almost exactly with the angle of the hoof, to the front of the shoe. This is the left hind foot. Notice the angle of the toe. 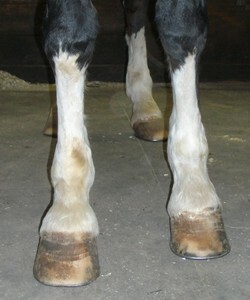 It too has been shod with a very low angle, long toe, and low heel. The angle of the heel runs under and there is a large discrepency between the angle of the hoof wall at the toe and at the heel. No explanation necessary – too much toe. This is a view of the left hind foot as Mark is paring out the frog. 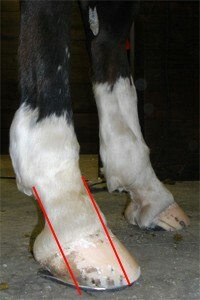 If you draw a line across the horse’s foot, as shown here, at the apex, or point, of the frog, the proportion should be two thirds volume towards the heel, one third in the toe. Here the proportion is just over half in front, half behind. 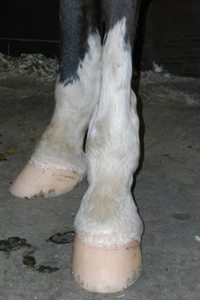 This is normal when looking at hooves with a low angle, long toe, and low heel. The breakover point is moved so far forward that it places great strain on the muscles and tendons in the leg. It also causes the heels to contract and can ultimately produce mechanical founder. You can also see how the frog and toe of the foot twists to the inside when looking in relation to the heel. The hoof has been trimmed. You can see the strain still in the pasterns and this foot will ultimately be shod with a wedge. At first glance, this shoe looks to be set up twisted on the foot. The shoe has a trailer on the outside in order to support proper movement. The frog is twisted off center to the inside and the toe is slightly twisted to the outside due to unlevel shoeing previously. If you look instead at the placement of the toe of the shoe in relation to the buttress of the heels and the placement of the toe nails you will notice that the shoe is placed correctly for the structure of the foot as it should be, but also is shaped to support the strudture that currently exisits. The toe hangs over the toe of the shoe in order to bring the breakover point back to a more appropriate length. 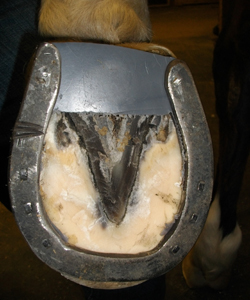 These changes in the shoe will encourage the foot to straighten out as it relaxes and grows and will be considerably straigher when the horse is reset in six to eight weeks. Here the foot has been finished. Because the shoe is set back so far to encourage a quicker breakover the toe can not be taken down to meet with the shoe. 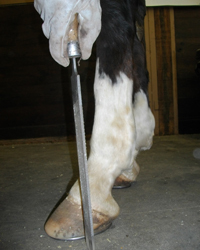 This square toe is exaggerated but is also often used on this type of show horse to encourage faster breakover and help the horse avoid stepping off the extended heel front shoes. 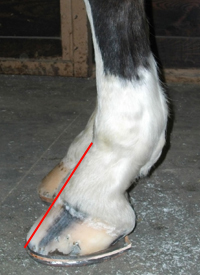 The horse here is not bearing weight on the hind foot so it is not quite exact to show the alignment of the angle of the breakover with the angle of the pastern. This is the right hind foot. Here you can see that the proportion is closer to normal but the toe region is still larger than it should be. There is also a flair on the inside and the frog and toe and heel are not in alignment. The trimmed right hind foot. 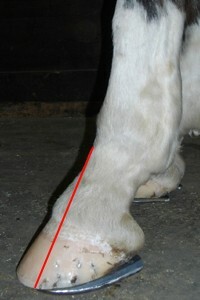 The coronary band is level here and the pastern is fairly smooth, indicating that the foot is level and at the correct angle. 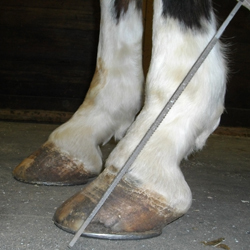 Here is the right hind foot, shod without wedges. There is a small trailer on the outside. The toe of the shoe is squared and set back in order to create a quicker breakover and to put the foot into proportion – one third of the ground surface/hoof volume in front of the apex of the frog, two thirds of the ground surface/volume behind. The finished right hind foot. 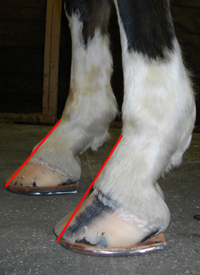 The angle of pastern to toe of the shoe is correct, the heels are supported, and the toe is squared off. Tagged horseshoeing, long toe low heel, shoeing english horses. Bookmark the permalink.